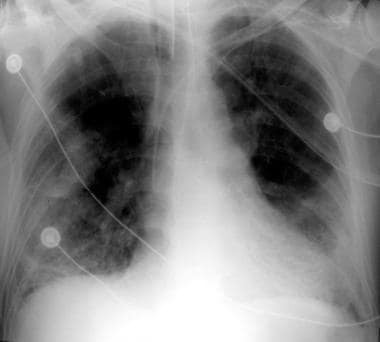 Acute respiratory distress syndrome (ARDS) is defined by the acute onset of bilateral pulmonary infiltrates and severe hypoxemia in the absence of evidence of cardiogenic pulmonary edema. Workup includes selected laboratory tests, diagnostic imaging, hemodynamic monitoring, and bronchoscopy. ARDS is a clinical diagnosis, and no specific laboratory abnormalities are noted beyond the expected disturbances in gas exchange and radiographic findings. In ARDS, if the partial pressure of oxygen in the patient’s arterial blood (PaO2) is divided by the fraction of oxygen in the inspired air (FiO2), the result is 300 or less. For patients breathing 100% oxygen, this means that the PaO2 is less than 300. In addition to hypoxemia, arterial blood gases often initially show a respiratory alkalosis. However, in ARDS occurring in the context of sepsis, a metabolic acidosis with or without respiratory compensation may be present. As the condition progresses and the work of breathing increases, the partial pressure of carbon dioxide (PCO2) begins to rise and respiratory alkalosis gives way to respiratory acidosis. Patients on mechanical ventilation for ARDS may be allowed to remain hypercapnic (permissive hypercapnia) to achieve the goals of low tidal volume and limited plateau pressure ventilator strategies aimed at limiting ventilator-associated lung injury. Hematologic - In septic patients, leukopenia or leukocytosis may be noted. Thrombocytopenia may be observed in septic patients in the presence of disseminated intravascular coagulation (DIC). Von Willebrand factor (VWF) may be elevated in patients at risk for ARDS and may be a marker of endothelial injury. Renal - Acute tubular necrosis (ATN) often ensues in the course of ARDS, probably from ischemia to the kidneys. Renal function should be closely monitored. Hepatic - Liver function abnormalities may be noted in either a pattern of hepatocellular injury or cholestasis. Cytokines - Multiple cytokines, such as interleukin (IL)–1, IL-6, and IL-8, are elevated in the serum of patients at risk for ARDS. ARDS is defined by the presence of bilateral pulmonary infiltrates. The infiltrates may be diffuse and symmetric or asymmetric, especially if superimposed upon preexisting lung disease or if the insult causing ARDS was a pulmonary process, such as aspiration or lung contusion. The pulmonary infiltrates usually evolve rapidly, with maximal severity within the first 3 days. Infiltrates can be noted on chest radiographs almost immediately after the onset of gas exchange abnormalities. They may be interstitial, characterized by alveolar filling, or both. Initially, the infiltrates may have a patchy peripheral distribution, but soon they progress to diffuse bilateral involvement with ground glass changes or frank alveolar infiltrates (see the image below). The correlation between radiographic findings and severity of hypoxemia is highly variable. In addition, diuresis tends to improve infiltrates and volume overload tends to worsen them, irrespective of improvement or worsening in underlying ARDS. For patients who begin to improve and show signs of resolution, improvement in radiographic abnormalities generally occurs over 10-14 days; however, more protracted courses are common. In general, clinical evaluation and routine chest radiography are sufficient in patients with ARDS. However, computed tomography (CT) scanning may be indicated in some situations. CT scanning is more sensitive than plain chest radiography in detecting pulmonary interstitial emphysema, pneumothoraces and pneumomediastinum, pleural effusions, cavitation, and mediastinal lymphadenopathy. The heterogeneity of alveolar involvement is often apparent on CT scan even in the presence of diffuse homogeneous infiltrates on routine chest radiograph. In some instances, the discovery of unexpected pulmonary pathology, such as a pneumothorax, may be lifesaving. However, this potential benefit must be weighed against the risk associated with transporting a critically ill patient on high-intensity mechanical ventilation out of the intensive care unit (ICU) to the CT scan equipment. Because patients with severe ARDS often require prolonged prone positioning due to refractory hypoxemia, a study assessed the use of transesophageal echocardiography (TEE) in patients in the prone position. The study determined that TEE can be safely and efficiently performed in patients with severe ARDS in the prone position. Because avoiding fluid-overload may be beneficial in the management of ARDS, the use of a central venous catheter or pulmonary artery catheter may facilitate appropriate fluid management in these patients in whom judging intravascular volume status on clinical grounds may be difficult or impossible. This may be especially helpful in patients who are hypotensive or those with associated renal failure. Although pulmonary artery catheters provide considerable information, their use is not without controversy. The ARDS Clinical Trials Network studied whether a difference in mortality could be found in ARDS patients whose fluid management was guided by pulmonary artery catheter versus central venous catheter after initial resuscitation. The study found no difference in mortality, ventilator days, ICU days, or need for pressors or dialysis The pulmonary artery catheter group had twice as many catheter-related complications, primarily arrhythmias. Still, more patients were excluded from the study because they had already received a pulmonary artery catheter than were randomized into both groups combined. And, when the nonrandomized patients were studied, their mortality was similar to both control groups. Another large retrospective study of critically ill patients monitored with pulmonary artery catheters in the first 24 hours of ICU admission showed that patients with pulmonary artery catheters had an increased mortality rate, hospital cost, and length of stay compared with a retrospectively developed matched patient group managed without them. Thus, use of the generic pulmonary artery catheter past the time of initial resuscitation confers no survival benefit and possibly has an adverse effect on survival. In addition, accurate measurement of hemodynamic parameters with the pulmonary artery catheter requires skill and care. This is especially difficult in patients either on mechanical ventilation or with forced spontaneous inspirations because the pressure tracing is affected by intrathoracic pressure. PCWP should be measured at end-expiration and from the tracing rather than from digital displays on the bedside monitor. Bronchoscopy may be considered to evaluate the possibility of infection, alveolar hemorrhage, or acute eosinophilic pneumonia in patients acutely ill with bilateral pulmonary infiltrates. Culture material may be obtained by wedging the bronchoscope in a subsegmental bronchus and collecting the fluid suctioned after instilling large volumes of nonbacteriostatic saline (bronchoalveolar lavage; BAL). The fluid is analyzed for cell differential, cytology, silver stain, and Gram stain and is quantitatively cultured. Ten thousand organisms per milliliter is generally considered significant in a patient not previously treated with antibiotics. As noted (see above), early ARDS is characterized by the presence of neutrophils in the BAL fluid, so the presence of intracellular organisms and the use of quantitative culture are important in establishing infection. An alternative means of obtaining a culture is by means of a protected specimen brush, which is passed through the bronchoscope into a segmental bronchus. Subsequently, the brush is cut off into 1 mL of sterile nonbacteriostatic saline. Culture of 1000 organisms is considered significant. Analysis of the types of cells present in the BAL fluid may be helpful in the differential diagnosis of patients with ARDS. For example, the finding of a high percentage of eosinophils (>20%) in the BAL fluid is consistent with the diagnosis of acute eosinophilic pneumonia. The use of high-dose corticosteroids in these patients may be lifesaving. A high proportion of lymphocytes may be observed in acute hypersensitivity pneumonitis, sarcoidosis, or bronchiolitis obliterans-organizing pneumonia (BOOP). Red cells and hemosiderin-laden macrophages may be observed in pulmonary hemorrhage. Lipid laden macrophages are suggestive of aspiration or lipoid pneumonia. Cytologic evaluation of the BAL fluid may also be helpful in the differential diagnosis of ARDS. This may reveal viral cytopathic changes, for example. Silver stain may be helpful in diagnosing an infection, such as Pneumocystis. The use of bronchoscopy as an adjunct to surfactant therapy has been reported. In 10 adults with ARDS, sequential bronchopulmonary segmental lavage with a dilute synthetic was safe, well tolerated, and associated with a decrease in oxygen requirements. To the authors’ knowledge, no study has been performed to compare the use of surfactant with or without bronchoscopy in the setting of ARDS. 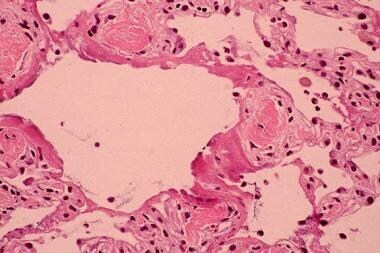 The histologic changes in ARDS are those of diffuse alveolar damage. An exudative phase occurs in the first several days and is characterized by interstitial edema, alveolar hemorrhage and edema, alveolar collapse, pulmonary capillary congestion, and hyaline membrane formation (see the image below). These histologic changes are nonspecific and do not provide information that would allow the pathologist to determine the cause of the ARDS. A biopsy performed after several days shows the beginning of organization of the intra-alveolar exudate and repair, the proliferative phase of ARDS, which is characterized by the growth of type 2 pneumocytes in the alveolar walls and the appearance of fibroblasts, myofibroblasts, and collagen deposition in the interstitium. The final phase of ARDS is fibrotic. Alveolar walls are thickened by connective tissue rather than edema or cellular infiltrate.